Wizards Watch was my most productive column, with 11 posts during the year. The majority of posts were on the subject of DnDNext, which of course has one of the major topics in the D&D world this year. Truth to be told, I’m no longer really following along as closely as I was, as I’m concentrating on my 4E kids’ campaign: Wizards Watch: An Admission. I guess the column I was most disappointed in was Content Corner, as it was probably the one I most wanted to get going regularly, but in the end I only managed 5 posts. The ‘Havenscoast Project’, a 4E Gazetteer of a region of Tolrendor, was intended to be the main subject, but I also published a fun ‘Buying Horses‘ skill challenge, a short delve ‘Rats Below‘ and some nasty Fey Spiders! I certainly found that trying to rush design and publication of worthwhile content is hard!! If I’m going to do better next year, more forward planning is required! My fantasy cartography column Map of the Month tends to be the most popular on the site in terms of visitors. I had a mix of posts, some showing off my own work, such as this map of the Havenscoast region, as well as highlighting some of the great mapping sites on the internet e.g. here, and here … and many others! RPG Tech Talk was a lot of fun. I ended up posting 8 times during the year, and covered a varied range of topics: PDF encryption, the iBooks format for RPGs, the Tech Gametable, and campaign note-taking using Microsoft OneNote. On other subjects, I participated in a couple of RPG Blog Carnivals, always good for getting a few more links into the site. I like these, as the subjects are often a bit outside the area of my typical post, so add some variety! 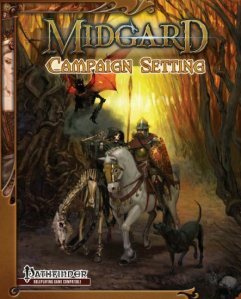 Having participated in a number of Kickstarter/Patronage projects with Open Design for the last couple of years, the highlight release this year was the Midgard Campaign Setting. Having really enjoyed this product, I decided to do a multi-part review, which is still ongoing (so far, here, here and here…) – it’s a big book after all! This series has generated a large amount of traffic to the blog, co-inciding with my best ever day in terms of hits. See you next year for more gaming content, comment and fun!! This entry was posted in Columns, Midgard Campaign Setting, Miscellaneous, RPG Blog Carnival. Bookmark the permalink.